Ireland is in a league of its own in the European Union in terms of issuing public contingent liabilities for private financial institutions with a potentially crippling 176 percent of GDP—more than four times the scale of the second largest sovereign provider of contingent liabilities, the United Kingdom with 39 percent, and at least 10 times the scale of any other EU member. It seems obvious that some future limitation on the ability of eurozone governments to issue these kinds of guarantees to domestic financial institutions must be part of any longer-term crisis resolution mechanism. With a permanent eurozone crisis support mechanism being negotiated right now (whatever conditionality it will end up having), the option that eurozone sovereigns can suddenly, like Ireland today, become "insolvent on a consolidated basis" due to the scale of their banking sector guarantees must be eliminated. This is critical as a large number of eurozone sovereigns (and other EU countries) have oversized banking sectors relative to the size of their GDP and available fiscal space. This suggests that any permanent eurozone crisis resolution mechanism for sovereigns should also include a "eurozone FDIC-like entity" to quickly wind down the banking sector exposures of eurozone sovereigns receiving financial assistance. Or put in another way, one of the outcomes of the coming Irish bailout will be a restructuring of its banking system, and should in that process entail a substantial shrinking of the Irish financial sector as a whole. The Irish bailout cannot be separated from the broader reform process of the EU financial system. But the question remains: What is the ECB to do? Were it to suddenly turn off the tap for liquidity to Irish banks, it would jeopardize the €130 billion in outstanding ECB loans to Irish banks at the end of October 2010, potentially trigger a chain-reaction through the global banking system, as well as being the entity that pulls the trigger and causes an economic collapse in one of its member states. Even for a genuinely independent and legally untouchable central bank, these are (?) serious implications of its preferred course of action that would potentially undermine its crisis stabilization efforts so far. These are consequential decisions only democratically elected leaders should ever have to take. No wonder it is so keen on the Irish accepting money from other foreign official sources, rather than just the ECB! In this, of course the ECB is not alone, as the other eurozone governments are equally keen for the Irish government to officially request aid. First of all, as mentioned, to eliminate the risk of systemic-level contagion to the eurozone (e.g., Spain) but also with a nontrivial amount of self-interest. Here the considerable geographic location difference of the foreign exposures between Greece and Ireland should be noted. This is illustrated in figure 2. 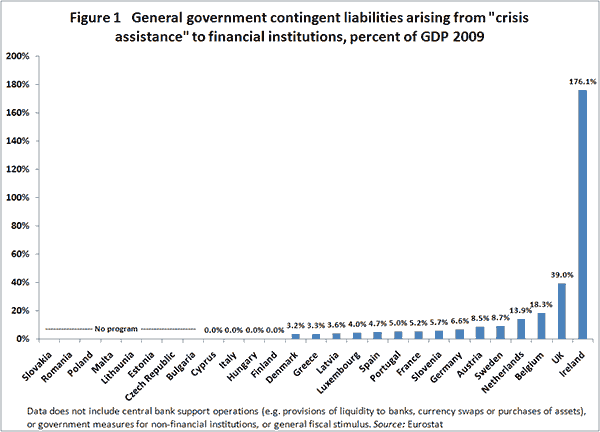 Figure 2 approximates, with available Bank for International Settlements (BIS) data, how the foreign bank claims (24 countries reporting to the BIS) on Ireland at over $500 billion are more than three times the scale of total claims against Greece.5 The hypothetical implications of even an isolated (i.e., without contagion) Irish economic collapse would thus as a first approximation be considerably larger than was the case for Greece. Meanwhile, while country exposure to Greece according to this BIS data is concentrated in French, German, and to a lesser extent Portuguese banks, German and British banks alone account for over half the total exposure to Ireland. Contrary to Greece, US banks have a sizable Irish exposure, too, according to the BIS data. Getting substantial IMF funding for Ireland should therefore not be an obstacle, given the US influence here. As was the case in Greece, Italian and Spanish banks have considerably smaller private exposures to Ireland than these countries with ownership stakes in the ECB or shares of the European Financial Stability Facility (EFSF) financing (18 and 12 percent respectively). As such, any losses on Ireland ultimately distributed by either the ECB (through reduced payments to the eurozone members) or the EFSF will in all probability lead to these two countries paying a disproportionately large share hereof. German banks' relative exposure to Ireland (just over a quarter of total reported exposure in the BIS data) roughly approximates Germany's 27 percent ownership share of the ECB. Clearly seen in this light, too, eurozone members should expect "voluntary" bilateral contributions from the United Kingdom to any assistance for Ireland. The next question is just what kind of conditionality the European Union and the IMF should demand on the financial aid provided to Ireland—apart from the demands to restructure and shrink the banking sector discussed above. Greece was the most corrupt and mismanaged economy in the OECD precrisis, and the "to-do list" of structural reforms in the labor and product markets, social system, tax collection, and everywhere else was very long and read pretty straightforward from standard "supply-side economics." As such, conditionality in Greece was easy. Ireland is a different animal altogether. Not unlike the Asian economies in 1997, it does not lend itself immediately to a standard "it's mostly fiscal" IMF-style program. Ireland already has labor markets that are among the most flexible in the OECD, flexible product markets, and a relatively small government sector. After all, it was the "Celtic tiger" not too long ago. What to demand? Expect more of the "boiler plate" stuff in the form of more austerity from spending cuts, combined with some relatively modest government revenue increases. This, however, may not be enough to return Ireland to solvency on a "consolidated basis." An immediate scaling back of the government guarantee for senior bank creditors (i.e., potentially imposing haircut losses on more than just subordinate creditors for all Irish banks) must be considered, even if the structure of much of this debt under UK law likely poses a formidable legal challenge. The prospect of bailing out "other countries' banks" (having to bail out your own banks is bad enough in political terms) might otherwise sour the public and political mood sufficiently across the eurozone to undermine future support for any permanent resolution mechanism, leaving the euro potentially naked after May 2013. Then there is the thorny issue of the low Irish corporate tax rate, which other eurozone countries (and the United States) rightly see as a beggar-thy-neighbor policy, politically unsustainable in a bailout scenario. At the same time, of course, the low corporate tax rate is instrumental for any growth prospects for the postcrisis Irish economy. Given the slump in the domestic economy and the relatively limited scope for additional pro-growth structural reforms, Ireland's only realistic hope to return to growth in the medium term is accelerating outward migration (reverting again to Ireland's historical practice ) and continuing to attract FDI (including preventing the existing foreign investors from leaving) through low corporate taxes. As such, the Irish government is right, too, to fight hard against these demands. A compromise on the corporate tax issue, however, is possible. There will be no immediate increase in the Irish corporate tax rate, thus salvaging Irish political pride and its immediate growth prospects. However, in the longer term Irish corporate tax rates will be slowly "harmonized upward and outward" as EU members move their national corporate tax bases and rates closer together. This will allow the eurozone to claim that they have brought beggar-thy-neighbor to an end. Expect therefore in 4 to 5 years time that the Irish corporate tax rates will have shifted upward by probably about 5 percentage points. In sum, Ireland will probably be the future textbook example of "supply-side economics gone wild" and the dangers of politically failing to properly regulate and constrain the banking system. 1. LCH.Clearnet's recent decision to raise margin requirements for trading in Irish government bonds to 30 percent will only add to this. 2 In a classic case of self-fulfilling prophecies, one can speculate that such clients with assets in Irish banks above the sacrosanct retail deposit guarantee limit have been rationally conducting a "silent large client bank run" to get their money out before the broad Irish government financial sector guarantee becomes untenable (and only retail depositors can be certain to remain fully protected). 3. The so-called "Eligible Liabilities Guarantee Scheme" (ELG) provides an unconditional and irrevocable Irish government guarantee for eligible liabilities (including deposits) of up to five years in maturity incurred by participating institutions. This includes senior unsecured certificates of deposit; senior unsecured commercial paper; and other senior unsecured bonds and notes. 4. The contingent liability data in figure 1 includes the value of assets and liabilities of financial institutions guaranteed by governments; securities issued by governments under liquidity schemes (e.g., repurchase agreements and securities lending); and liabilities of special purpose vehicles (SPVs) created during the financial crisis, including those to which impaired assets of financial institutions have been transferred (e.g., "bad banks"). The data do not include government guarantees on bank deposits. 5. There is often some confusion about the correct use of BIS data in the media. It is frequently reported that Britain has an exposure of about $195 billion to Ireland, while Germany and France have only about $50 billion. These data are wrong. These reports misunderstand how the BIS data is collected. What they report is the opposite—i.e., Irish banks' claims on foreign countries, not what foreign banks claim on Ireland. BIS data only provide the foreign claims against Ireland in the form of the reports from the 23 other nations reporting. 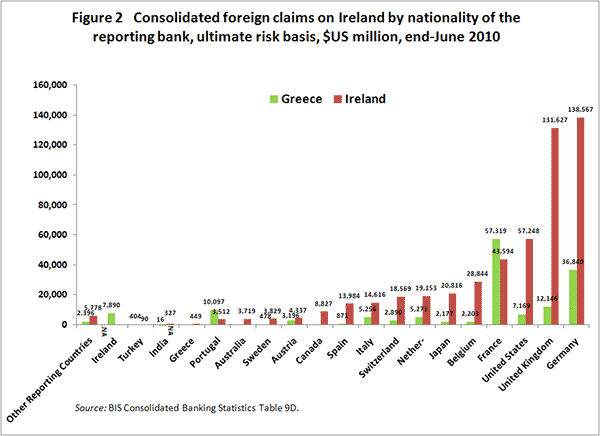 As such, total foreign bank claims against Ireland may be larger than what is reported in the BIS data. 6. This is arguably true for Germany, too, where the bank stress tests earlier this year revealed how the failed Hypo Real Estate (HRE) bank taken over by the German government had the largest exposure of any bank to Irish sovereign debt. HRE's total exposure to Ireland is likely far higher.